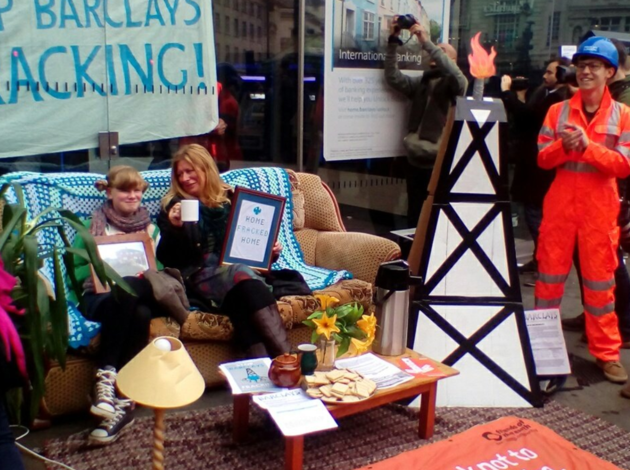 In over 90 branches of Barclays around the country, customers have recently been surprised to meet campaigners Bringing Fracking Home to Barclays. In various creative ways, these campaigners have highlighted the bank's ownership of Third Energy, who want to frack for shale oil in the beautiful North Yorkshire countryside. In central London, removal men delivered a sofa to a prime spot outside the Piccadilly Circus branch of Barclays bank, where Nicky Holling, a resident from Ryedale and her daughter Ruby, were served Yorkshire tea and biscuits. There was music, dancing and speeches in what was a family friendly event, organised by groups including Friends of the Earth, Divest London, Frack Free Ryedale, 350.org, Sum Of Us, Frack Off London, Go Fossil Free and Reclaim the Power. Campaign against Climate Change supporters joined around 100 people assembled over the 90 minute protest which shut down the branch, many activists vowing to return until the bank get the message and divests. The International Civil Aviation Organisation (ICAO) are meeting in Canada to make a deal to limit aviation emissions - the only problem is that the proposed deal would not in fact limit them in any meaningful way. The proposal is to allow emissions from aviation to increase 300%-700%, compensating for this with 'carbon offsetting. In the words of one critic, the deal 'has loopholes big enough to fly a jumbo jet through. Read more about Unions backing fracking... or are they?